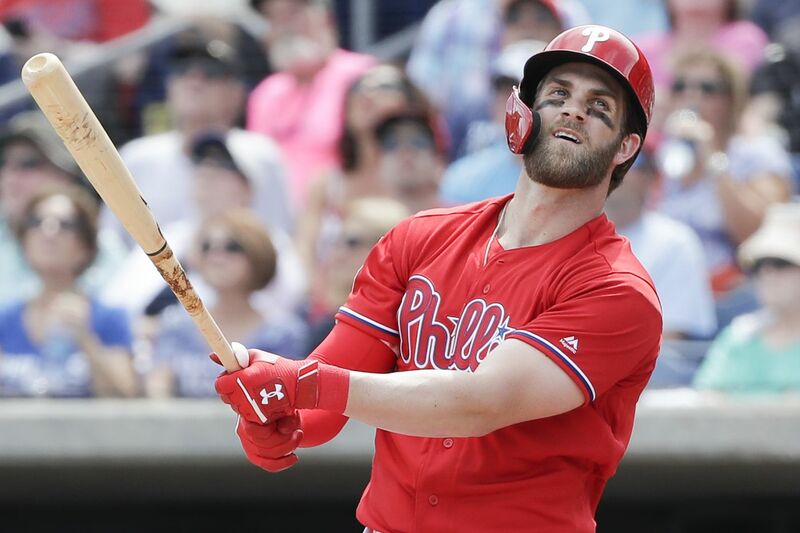 Phillies Bryce Harper bats against the Tampa Bay Rays in a spring training game on Monday, March 11, 2019 at Spectrum Field in Clearwater, FL. It took Rob McElhenney the better part of a decade to earn Chase Utley’s friendship following a beloved episode of It’s Always Sunny In Philadelphia in which his character, Mac, penned an overly enthusiastic fan latter for the former Phillie. But when it comes to new team member Bryce Harper, that same feat only took a couple of weeks, tops. McElhenney contacted Harper on social media on Monday following a tweet from the Phillies’ account that paired an imagine of the new Phillies outfielder with a quote from It’s Always Sunny’s “The Night Man Cometh” from 2008. In response, McElhenney asked Harper if he wanted to have a catch like in his old letter to Utley. About 90 minutes later, Harper responded positively, writing that he was sure the pair would have “a real ‘grand slam’ of a friendship,’ as McElhenney’s Mac formerly told Utley. “Let’s have a catch sometime this summer at the Bank,” Harper added. Trout, who has not tweeted since March 6, did not respond. McElhenney, of course, is no stranger to friendships with Philly sports icons thanks to his time on It’s Always Sunny. Last season, he even brought Jason Kelce and Beau Allen onto the showfor a special Super Bowl-themed episode.